10/5/2015Pulmonary Research Conference with Kara Gross, M.D. Indiana University launched the public phase of its first-ever, university-wide philanthropic campaign with a donor event Sept. 26 at the Indiana State Fairgrounds. The effort, called For All: The Indiana University Bicentennial Campaign, has set a record goal of $2.5 billion to be raised by 2020. One of the most notable gifts so far has come from Eli Lilly and Company, which, along with its charitable arm the Lilly Foundation, committed nearly $25 million, primarily in pharmaceutical donations, to the AMPATH (Academic Model Providing Access to Healthcare) program, a partnership between Kenya’s Moi University School of Medicine, Moi Teaching and Referral Hospital, and a consortium of North American academic health centers led by the IU School of Medicine. "The bold goals of the bicentennial campaign, which are the most ambitious in Indiana University's history and among the largest ever by a public university, will set Indiana University on the course for greatness in its third century," said IU President Michael A. McRobbie. "Built on our strategic priorities, this unprecedented undertaking will fulfill IU’s promise to change the way we live through path-breaking research, innovative academic programs, unparalleled international engagement and an accessible and exceptionally valuable education." To date, the campaign has raised nearly $1.2 billion with the participation of almost 204,000 donors, McRobbie said. To learn more about the campaign or to give a gift, visit forall.iu.edu. Read the full news release on the IU Newsroom. A new laboratory safety policy is now in place for IU students, faculty and visitors to ensure all labs on university property meet federal, state and local guidelines. The policy covers basic procedures such as prohibiting food and drink in labs and requiring emergency contact information be posted on the entrance to each lab. The policy also calls for people working in laboratories to wear safety glasses or goggles, latex gloves, a lab coat, long pants and closed-toed shoes. It also details responsibilities for everyone involved in managing the laboratory as well as specific rules for varying types of potential lab work, such as handling bloodborne pathogens or working with lasers, animals or robots. Possible sanctions for not following the policy include progressive disciplinary action, up to and including dismissal, as well as temporary and permanent closure of a lab. Read the full laboratory safety policy for more information. Andrew Kroger, M.D., medical officer at the Center for Immunization and Respiratory Diseases at the Centers for Disease Control & Prevention will present his talk, “Vaccine Hesitancy & Dispelling Myths,” at IUSM-Evansville as part of the Corcoran Lecture series. In his talk, Kroger will address many of the myths surrounding modern immunization and provide the most recent information regarding immunizations from the CDC. Kroger has published numerous articles on immunizations, vaccines and infectious disease. Most notably, Dr. Kroger is the author of the newest edition of the CDC’s General Recommendations on Immunization; and he is also involved with some of the new distance learning activities of the branch, including the Current Issues in Immunization Series that is delivered through NetConferencing. The lecture will be held on Oct. 20, from noon - 2 pm, in Carter Hall, 8600 University Blvd, Evansville, IN 47712. The lecture is free and open to the public. An invitational dinner will be held at the Old National Events Plaza at 6 pm. Contact IUSM-Evansville with questions about presentations at 812-464-1831. For more information about this event, visit the IUSM-Evansville website. 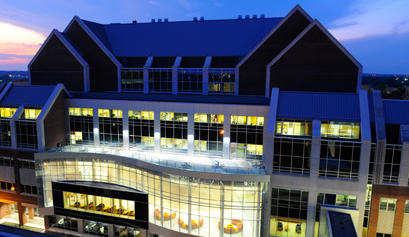 To boost the population of scientists studying musculoskeletal disorders and ultimately to improve treatment, the National Institutes of Health has awarded the Indiana University School of Medicine a $1.6 million, five-year grant for a Comprehensive Musculoskeletal Training Program. The grant for the new musculoskeletal training program will fund three pre-doctoral graduate students from any area of basic science or biomedical engineering, three post-doctoral fellows in labs involved in musculoskeletal research and three to five first-year medical students in a summer research program. The funding comes at a time when the aging of baby boomers is expected to dramatically increase rates of musculoskeletal disorders such as arthritis, bone fractures, back pain and muscle weakness. And while musculoskeletal disorders are the leading cause of disability in the U.S., federal investment in this research is disproportionately low. The grant was awarded in early 2015 and implemented in July, with five first-year medical students completing the summer program in 2015 and three pre-doctoral students currently at work. Recruitment is underway for the three post-doctoral fellows. "We’re always looking for skilled physician-scientists who can complement their clinical work with academic research. The post-doctoral positions can help us develop physician-scientists," said David Burr, Ph.D., and principal investigator on the grant. "At the same time, this training grant will help support the new Center for Musculoskeletal Health’s initiative to bring together both basic and clinical investigators in synchronized pursuit of solutions to musculoskeletal disease." Read more about this project on the IUSM Newsroom. Two Indiana University researchers have been awarded nearly $1.6 million to study how a non-drug treatment may benefit women with breast cancer who also experience muscle weakness and bone loss. The Department of Defense awarded Theresa Guise, M.D., the Jerry and Peggy Throgmartin Professor of Oncology at the IU School of Medicine and a researcher at the Indiana University Melvin and Bren Simon Cancer Center, and William Thompson, DPT, Ph.D., assistant professor at the IU School of Health & Rehabilitation Sciences, a three-year Breast Cancer Research Program Breakthrough Award. The two researchers propose that low-intensity vibration therapy may be a way to restrict muscle weakness and bone loss in patients with breast cancer. The vibration treatment may also prevent breast cancer from spreading to bones. The researchers will test low-intensity vibration therapy on mice with breast cancer in the bone as well as genetically engineered mice, both alone and in combination with bisphosphonate treatment, to determine effectiveness. Bisphosphonates are drugs which block bone breakdown and are a standard therapy for patients with low bone density, osteoporosis or breast cancer that has spread to the bone. If the proposed experiments are effective in mice, the next step will be to test the therapies in patients with breast cancer. To read more about this research and award, visit the IUSM Newsroom. If you get a skin infection, whether it goes away on its own or you need to get medical treatment may be determined by what bacteria already make your skin their home, say scientists at the Indiana University School of Medicine. In a study reported in mBio, a journal published by the American Society for Microbiology, the researchers found that differences in the skin microbiome -- the community of microorganisms that lives on the skin -- were associated with differing outcomes in skin infections. In addition, the skin infections in turn led to changes in the skin microbiomes. The researchers infected the arms of eight volunteers with Haemophilus ducreyi, a bacteria that causes genital ulcers in Africa and Asia and disfiguring leg ulcers in children in equatorial Africa and the South Pacific. The skin microbiome was assessed before, during and after the infections. In four of the volunteers, the infections resolved on their own; the other four formed abscesses. All of the volunteers were treated with antibiotics. "This is the first prospective study to show that the skin microbiome is associated with susceptibility to skin infection and that infection outcome influences the skin microbiome," said Stanley M. Spinola, M.D., chair and professor of microbiology and immunology at the IU School of Medicine and principal investigator for the study. To read more about this study, visit the IUSM Newsroom. The American Medical Association recently recognized four IU School of Medicine faculty as 2015 Inspirational Physicians. Diane Mary Janowicz, M.D., Theresa Rohr-Kirchgraber, M.D., Grace Rozycki, M.D., and Chemen Tate, M.D., are among 30 physicians nationwide receiving this honor. Dr. Rohr-Kirchgraber, Dr. Rozycki and Dr. Tate were recognized for their outstanding commitment to mentoring, and Dr. Janowicz was also recognized for her dedicated work with the HIV outbreak in Southern Indiana. For more information, visit the American Medical Association website. Several IUSM faculty members were honored for their work at Tuesday’s Fall Faculty Meeting. The honorees and their awards are listed below. To view minutes from the meeting, visit the Faculty Steering Committee website. Stacy Walters knows firsthand the difference doctors make in the lives of patients and families. That's why the future M.D. 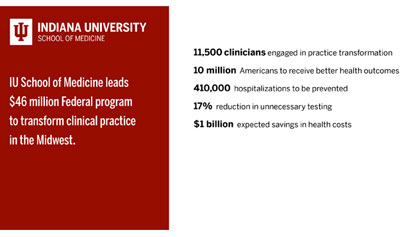 is grateful for scholarships and financial aid from the IU School of Medicine. Free from financial uncertainty, she can focus on her education and clinical training—the things that will be indispensable to her ability to provide quality care. Watch her video, “Making Healing Happen,” On the IU Foundation’s YouTube channel. Three IU researchers will receive $1.75 million total in grants to investigate the biology of breast tissue and breast cancer cells, and to study inflammation. The Susan G. Komen Tissue Bank at Indiana University Simon Cancer Center, led by Anna Maria Storniolo, M.D., and the only repository in the world for normal breast tissue and matched serum, plasma and DNA, will receive $1.1 million to support the collection and study of normal breast tissue, accelerating research for the causes and prevention of breast cancer. Theresa Guise, M.D., will receive $200,000 to test whether breast cancer-associated inflammation causes molecular changes in muscle, which result in muscle weakness and a reduced quality of life for women living with advanced breast cancer. Dr. Guise is looking for specific causes of muscle weakness due to inflammation and testing potential drugs that may alleviate the inflammation and lead to improved muscle strength. Chunyan He, Sc.D., B.A., will receive $450,000 to study changes due to different environmental exposures, to gene activity (epigenetics) in order to identify changes that indicate cancer will likely begin to develop. This research may identify environmental exposures and create the opportunity to develop effective therapies that can prevent the development of breast cancer. These grants bring Komen’s total research investment in Indiana to more than $25 million since 1982. Read more about this funding and research at komenindy.org. The Inside IU newsletter’s "Pride of Indiana" feature recognizes faculty and staff for oustanding contributions, or for work they’ve done that goes above and beyond their job duties or responsibilities. -Nominations should not be used to promote commercial products. -Nominations should not be reflective of personal favors or non-IU-related activities. -The nominee will have the opportunity to decline public recognition. -All nominations should be 150 words or less. -Inside IU editorial staff has the final word when determining which submissions are suitable for publication and reserves the right to edit for length and style. To nominate someone, read the full guidelines or read example nominations, visit the Inside IU submission form page. Have an upcoming event, lecture, seminar or guest speaker? Faculty, staff and student organizations are invited to submit their announcements to MedTV. The updated submission link for MedTV can be found at: http://medicine.iu.edu/about/communications/medtv. Requests must be submitted at least a week prior to the event date. Before submitting, please read the following guidelines. Email medtv@iupui.edu with any questions regarding submissions. Kent Brantly, M.D., IU School of Medicine graduate and author of the book “Called for Life,” was included in the Indianapolis Business Journal’s 2015 interview issue. In the interview, Brantly talks about how his education at the IU School of Medicine and Heritage Christian School prepared him for his work in Liberia. He credits IUSM mentors and classmates for nurturing his interest in medical missions. He also discusses his experience with Ebola, his faith and the current health needs in Liberia. Read his full interview online at the IBJ. IUSM's College & House mentorship program was mentioned in an article published by the Association of American Medical Colleges about reducing the stigma surrounding suicide rates among medical students and physicians. In a field where suicide is the second most common cause of death for medical students after accidents, the article cites the importance of mentorship programs like College & House that provide a safety net for students. Read the full article at aamc.org or visit the College & House website to learn more about the program. The 2015 IUSM Postdoc Symposium will be held on Friday, Oct. 9, from 12:30 to 5 pm, in the Van Nuys Medical Science Building. This half-day symposium will highlight the research contributions of IU School of Medicine and IUPUI postdocs. A poster session in the Medical Science Building Atrium will be held from 12:30 to 2:30 pm. Oral presentations will follow from 2:45 to 4:30 pm. All faculty, students, and staff are invited to attend this free symposium that has been organized by the IUSM Postdoctoral Association. The deadline for postdocs to submit late-breaking abstracts to be presented as posters is Friday, Oct. 2, at 11:59 pm. To register or submit an abstract, click here. Contact Emily Blue at emblue@iu.edu with any further questions. The exhibit celebrates the achievements of African American pioneers in medicine by highlighting four surgeons and educators who exemplify excellence in their fields and believe in continuing the journey of excellence through the education and mentoring of young African Americans. To learn more about the exhibit, visit the U.S. National Library of Medicine website. During the month of October, the Ruth Lilly Medical Library will host a variety of events to celebrate National Medical Librarians Month. Stop by from 11 am to noon for free popcorn. Stop by the library to participate in the candy guessing game -- the closest guess wins the jar of M&Ms. Pictures will be available on the library’s Facebook page. Winners will be notified on Oct. 18. All campuses are invited to participate - the prize will be mailed if necessary. One runner-up from each campus will receive a thermos with a small bag of candy inside. Live music will be played inside the entrance of the library on the first floor. LifeSaver Fridays! Stop by the circulation desk and get your end-of-the-week LifeSaver candy. “Trick or Tweet” days – see the Facebook page as the dates get closer for more details.